Our 100th episode!!!! We bring in some very special guests for this Episode. John Tole and Scott Boxenbaum show up to tell us great stories about comedy and their road to comedy stardom. This is a Great listen! And go get John’s brand new album!! 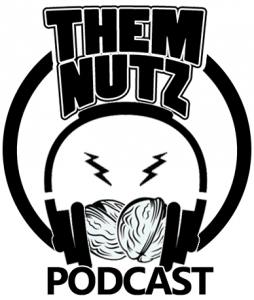 We had Steve Trevino and his special guest Alex Phillips in the studio with the Themnutz crew. Sharing great stories and advice on the comedy game. Make sure you check out out stevetrevino.com. Derrick has been bringing the laughs to comedy clubs all over SoCal. He is a writer and host for the SillyAss Podcast as well as the co creator, writer and host of the Jack of all Nerds podcast. Nick is a regular in the Los Angeles, Orange County and on the road comic. We talk about comedy from open mic, to booked Hollywood show. Very funny episode where Nick explains why he missed his last booking with us because of an accident.